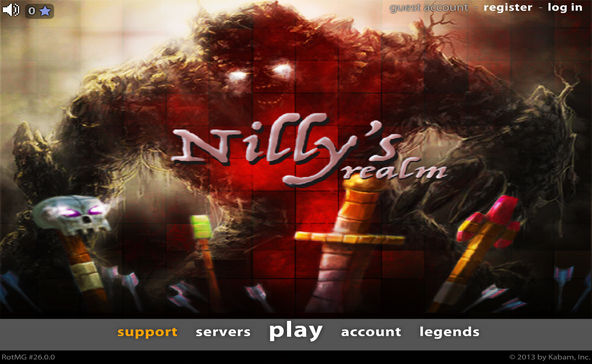 Nilly's Realm is a privately-developed game based on the flash game Realm of the Mad God, designed by Wild Shadow studios and now published and managed by Deca Games. Nilly's Realm is IN NO WAY AFFILIATED with the above companies. Nilly's Realm can be described as a 2-dimensional, pixel-drawn, bullet-hell game that runs on a Flash-based client. You may choose from 14 different classes, using a variety of weapons and abilities. Players navigate the game realm, killing enemies, gaining levels, raising attributes, and collecting unique and powerful equipment and items. Caution: Nilly's Realm is a Permanent Death Game. Once your HP reaches zero, that character will be lost forever! This Wiki serves as an information source for all things unique to Nilly's Realm. For discussion and community, please visit the forums. See our FAQ before you do anything else. All information on this site is accurate to the best of our knowledge, and sourced from information found in-game or on the forums. This site is maintained by a team of dedicated community members. Editing of the wiki is currently limited to approved editors only. If you notice an error and would like to submit a correction, or have a suggestion for this site, click here.